There are various webcams at the Mynd, courtesy of the Midland Gliding Club. On the time lapse cams, check the date and time in the bottom right. The detailed weather information is displayed below the webcam images. LMSC Webcam: Pointing north to the LMSC site (updated every minute). MGC Webcam: Pointing west to the windsock at the MGC (updated every minute). We now have two time lapse cams (courtesy of the MGC). If the images are static on your mobile device, or not updating, or to see it slightly bigger, use this link instead, and/or refresh the page (see the instructions at the top of this page). 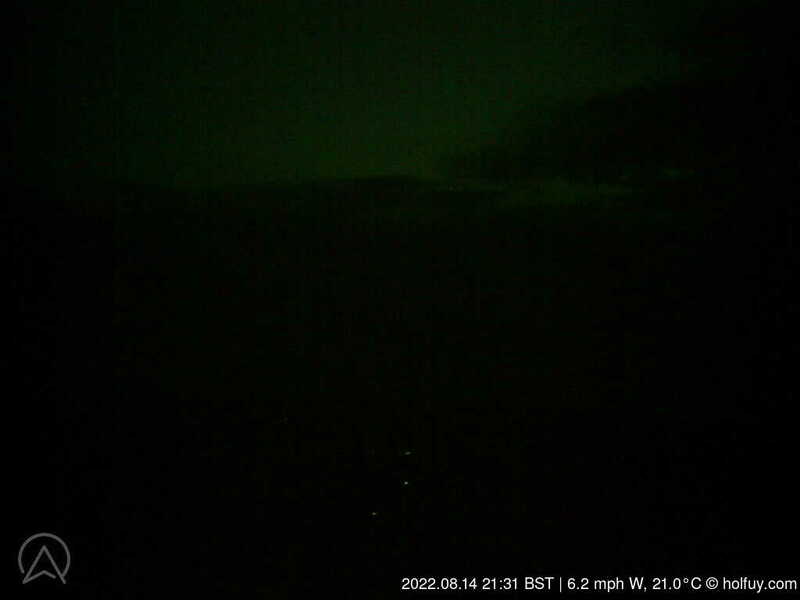 West cam: this shows the sky state over the last 40 minutes, updated every minute. Hangar cam: this is the view from the hangar looking east towards the usual MGC launch point, over the last hour. The images are updated each minute from just before/after sunrise/sunset. Weather station information. Updates every 15 minutes. Please note: Some people think the MGC located wind meter under-reads the speed – it’s in KNOTS and does read a bit low when the wind is off to the WSW or SW as affected by the trees and buildings, and is also well back from the venturi effect of the ridge, so please bear that in mind when reading the data below. This image below is from our weather station located near Sarn with the camera pointing at take off. Data collected constantly but averaged over 15 minutes, camera every ten minutes. Wind strengths etc. will be pretty accurate in in WNW – NE. It massively under-reads in an East or SE direction, but surprisingly tends to show the wind quite accurately as it runs down the hill behind when it is South to South West in direction. Most recent camera image below (updated every 10 minutes). Link to full data capture (history, trends in graphs and charts) – Opens in a new window. Once in that new window if you click on the header ‘Camera’ you will get a complete listing of the days photographs in time order rather than just the one current one. If it is flyable wings can just about be seen ground handling or flying. Clatter is currently open to LMSC members only (temporary guest membership can be obtained by contacting any committee member). Data collected constantly but averaged over 15 minutes, camera every twenty minutes. Wind strengths etc. will be pretty accurate in a SW wind, other directions not yet known. Being located on top of a hill in Mid Wales it is expected that the skystate and weather information will be of some use relating to our other sites in the area. Finally, it’s installed on site at Clatter, with the camera looking west across towards launch. Most recent camera image below (updated every 20 minutes). The club have put a webcam looking east towards the Long Mynd. The unit is located 7Km due west of the MGC clubhouse and looks towards the sky over our part of the hill. It’s too far away to see the hill or people flying, but is ideal to see what’s on the way while you’re sitting in orographic cloud on the Mynd, or if you expect conditions to change. There is a windsock about 30 metres away from the camera – it’s just a small lightweight one about 8 metres above ground. Currently it is mostly white which is not so easy to see. There are buildings nearby but it is reported that it is surprisingly reliable for direction and strength. Updates every 15 minutes. Please note that as a temporary measure to see if it reduces the early morning sun-glare, we’ve put a bit of foil as a shroud around around the camera, which is why some of the picture is blacked out. Other local weather stations are listed below. Gyrn. The station is located on Pentre Farm, which is the farm directly below the main flying ridge. Barmouth – multiple cams & weather station, useful for seeing the weather coming in from the coast. All UK – some of these will no longer be active. These are available on the pages for the individual sites. These are a bit complicated, so see the main RASP page for an explanation. Frixo is a road travel reporting website, that provides users with the up-to-date road traffic information. Data is updated every 5 minutes using sensors placed on motorways and common A / B roads.